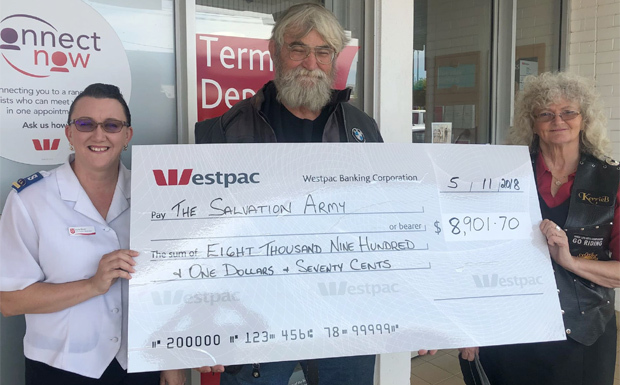 The Salvation Army’s drought relief efforts received a welcome boost this week, thanks to a big effort from local motorbike riders. On Monday, Lynnsay Fryer, from Big Bike Tours, and Kerrie Bantoft, from Kerrie B’s Motor-Bikery, handed over a cheque for $8901.70 to Kylie Birch from the Salvation Army’s South Burnett Corps. The money came from the Bikers4Farmers Drought Meet the Wooroolin couple organised at Kingaroy Showgrounds in mid-September, along with two smaller extra fundraising activities they carried out in Nanango and Yarraman over the following weeks. The idea for the Drought Meet came about because Kerrie and Lynnsay wanted to do something to help drought-stricken farmers. They cooked up the basic idea fairly quickly, then put it together after a few phone calls to the Kingaroy Junior Motorcycle Speedway Club and the Salvation Army’s Kingaroy office. “The Junior Motorcycle Club told us they were holding the State Titles at the Showgrounds on September 15, and the Salvos told us they were heavily involved in drought relief work,” Lynnsay said. Kerrie and Lynnsay used their contacts to assemble a collection of raffle prizes, along with stickers and patches for the day. Then they put word about the event out on motorcycle club networks, where it spread quickly. 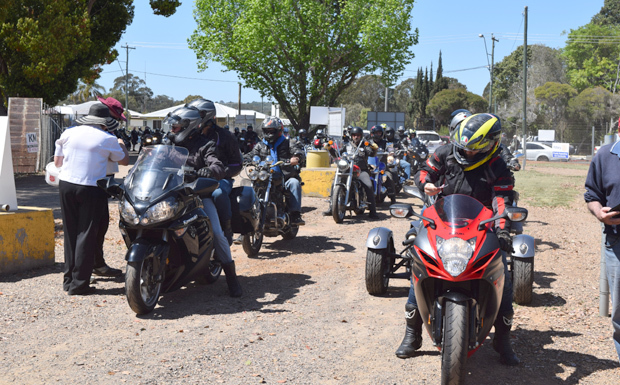 On the day, 575 motorcycles carrying more than 800 riders came through the Showgrounds’ gates. Riders travelled from as far afield as Mackay, Miles, Gladstone, Hervey Bay, Toowoomba and Brisbane to support the cause, which asked for a $10 donation per bike at the gates. They could also buy stickers, patches and raffle tickets, meet up with old friends, examine the motorcycle displays and watch the State Titles being run in main ring. Lynnsay and Kerrie said they were very happy to hand the cheque over to the Salvos. They also thanked all the businesses who donated raffle items and those who helped on the day including South Burnett Mayor Keith Campbell, who performed the Drought Meet’s official opening. The couple’s next community activity will be organising the annual South Burnett Toy Run, which will get under way next week.